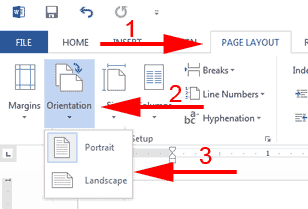 Word uses as a default, a page orientation of portrait. 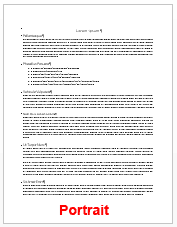 Depending on the type of document you are creating, you may want to change the orientation to landscape. Most paper has a long and a short edge. If you print in portrait, the shortest edge of the paper is the top of the page. If you print in landscape, the longest edge of the paper is the top of the page. 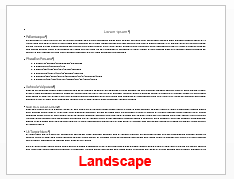 If you want the longest edge to be the top, create and print your document using the landscape orientation. Click Orientation in the Page Setup group. A gallery appears. Click the orientation you want. Word sets your page orientation. You can set orientation at print time. To learn more, see Print a Document.